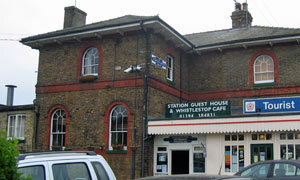 Next up on our whistlestop tour of Woodbridge coffee houses is, waddya know, the Whistlestop Cafe on Station Road. Can't miss it, since it's located in an old railway station building right on the platform, adjacent to the town's tourist information office. It's part of the Woodbridge station guest house, technically speaking. Check out the map. Plenty of pay & display parking spaces directly outside the station: finding an unoccupied space, however, requires good luck and timing. On our visit in the time-honoured Friday lunchtime spot, we were fortunate to find (a) a free spot and (b) a free table -- business was apparently good. Lots to choose from in the extensive pre-printed menu. Attentive and friendly service from the counter-girls. No hand-mixed smoothies on offer, alas, and a play-it-safe range of soft drinks. Food very much hit the spot, though: full marks for my sausage and onion ciabatta, and good value at around £4. Obligatory coffee -- an Americano -- was suitably strong too. Tempting array of traybakes: the cappucino slice was the popular choice. Thumbs up for the newspapers. Thumbs down for having them on sale rather than free to browse. Must mention the charming service again. And look out for the imposing station clock on the wall. If it was a car -- Renault Scenic. If they were passing by -- John Nettles.